I should consider myself lucky. Most budding Old Movie Weirdos don’t have as an ideal of an upbringing as I did. Yes, I grew up with a family where my grandmother could alert me that The Big Clock was about to come on; a family where if my brother came home at midnight and saw me watching Anatomy of a Murder, he’d get hooked and finish watching the film with me. And there was no greater film fan than my father. From the very beginning to the very end, films were such a joy to him. When he was a child, he would spend entire days just watching whatever was showing in the theaters. The love of going to the movies never stopped, just as his love of films in general never stopped. To him, there was no greater invention than the portable DVD player. This always amazed him as a marvel, and when he was done working his two jobs for the day he always put a film on at the kitchen table. I highly doubt my collection of DVDs could ever surpass the cornucopia he amassed over the years. After my father became sick in 2014, we enjoyed more films together than we ever had. No longer was it such a singular type of viewing for him. Sitting around watching TCM, it was something we experienced together often (that, and plenty of Seinfeld episodes). Our tastes in film never totally gelled–he adored westerns more than I ever could, and I never had a chance of getting him to watch a silent film. But more often than not, our tastes overlapped. There was nothing he loved more than a Woody Allen comedy or an Alfred Hitchcock film (Dial M for Murder and The Birds are two of the last films we watched together). And he was always, especially in these last years, eager to share a film or film moment he loved. The calls to gather around for a favorite scene of a film were common. He was especially eager to show George C. Scott’s version of A Christmas Carol. Never someone to cry often, that performance got him every time. My father passed away on April 22, 2017. In the time to come, I know I’ll find solace in the same way he did: in front of a good film. And when Christmas comes around, add George C. Scott’s A Christmas Carol to your viewing rotation. It comes highly recommended from a man who would know. With most silent films gone, film viewers today are always looking through a limited prism. Precious few have survived, and even fewer have been properly preserved and restored. As such, we’re most often exposed to the best silent films there are to offer, the true classics. There’s not a treasure trove of awful, bottom of the barrel silent films out there now. But they existed, of course. There were bad films then as there are now. We just haven’t seen most of the truly bad ones. Let’s change that. Let’s see what some of the worst of the worst may have looked like. Options are limited, but there’s still some choices out there. Old Photoplay magazines are ripe with brief, blistering reviews that tear apparent awful films to pieces. Very few people probably saw Combat after that. Unfortunately, a large number of the dozens of films Photoplay reviewed every issue are not available now. There are, though, some lambasted films that are available to torture yourself with. How bad are these films? Let’s find out, fellow film masochists. Crook stories usually keep one on the jump. But this one doesn’t, due to the draggy direction. 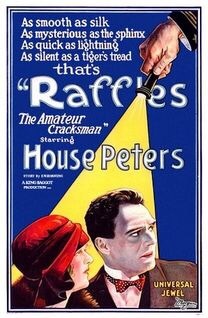 House Peters as Raffles, the amateur cracksman, moves around so slowly that at times you just feel like crowning him. And then to make matters worse they cast Miss DuPont, who is utterly colorless, as the lady in the case. Nothing worth while. Raffles is one of those plots that has been adapted over and over. Based on a popular story series of the time, seven different film versions were made between 1905 and 1939. And it is indeed a solid basis for a story. The title character is an elusive thief, stealing jewelry in cunning ways and then usually sneaking back the items later. He seems to be interested only the intellectual value of the steal itself, and getting the reward money donated to his favorite charity. This would all be very entertaining, if not for how dense the people are that Raffles is swindling. Raffles is supposed to be relying on his superior intellect to pull off these heists, but anyone with a pulse could rob these people blind. The charm is taken out when it’s blatantly obvious exactly how Raffles will pull everything off. In entertainment this can be compared with the first auto–missing on all sixes. The entire piece is slow moving and very tiresome. Of course it is interesting to see the first “boilers” that graded the highway–but that couldn’t make a picture. 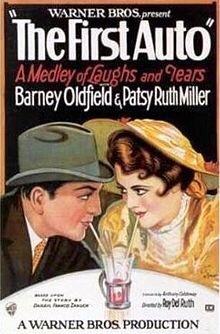 The poster for The First Auto may say “a medley of laughs and tears,” but it only produces one of those. For a film that is allegedly at least a a partial comedy, The First Auto is a shockingly dire and depressing melodrama. Animals, humans and property are all either killed, nearly killed or destroyed throughout the film. All the while, many characters are constantly hurting due to the barrage of catastrophes and cars throwing everything asunder. Even the Marquis de Sade would find this too much to handle. The First Auto is well made, but it is just wholly unpleasant to watch. The changes cars brought could be a compelling story, but not when it’s told in a heavy handed manner that hits you with absurd calamities so often. That just makes for a tough viewing experience that is a chore to get through. The film does contain some early sound usage, but the use is so limited as to not be worthwhile. Aside from a couple utterances of “Bob!” nothing else is done with it. The cool looking cars certainly don’t make up for the dark contents. Only recommended if you feel way too happy and need to change that. When a ship goes down and everyone but a helpless little girl is drowned–you can imagine the rest. Lorraine lives alone on an island from twelve years, the idol of the jungle beasts. (No, it’s not evolution propaganda.) As if that weren’t too much to believe, some occult power leads her rich grandfather to her, he in turn leading Norman Kerry to capture her heart. Talk about the long arm of coincidence making this kind of double play! Now I ask. The review above captures a lot of the absurdities of Lorraine of the Lions, and yet it somehow doesn’t capture all of them. There’s so much going on that is utterly ridiculous, things the viewer is supposed to take with a straight face. Within the first minutes, we’re casually alerted to the fact that Lorraine’s family is part of the circus. Even more amazing, Lorraine is an animal trainer at around the age of ten. It only gets wackier from there. While it all sounds very campy and goofy, too many other apspects are too dull to be fun. Yes, there’s a master of the occult, but you’d sooner think he’s an accountant than a master of black magic. Lorraine of the Lions is bad, and it’s too half-baked to be entertainingly bad. This wins the hand embroidered toothpick as being the worst picture of the month. The former Tarzan series were enjoyable. But this is filled with such improbabilities that it becomes ridiculous. It is an insult to the human intelligence to expect anyone to sit through this. Need more to be said? The original “Tarzan” stories were good. This is one of the biggest pieces of nonsense ever fed to a suffering camera. As a story, Tarzan and the Golden Lion is more paint-by-the-numbers than a child’s art set. Sure, there are a couple oddities here: Tarzan has a wife and sister. Overall, it’s a pedestrian and predictable story. His sister gets kidnapped, but of course Tarzan’s animal friends help save the day. The film is not quite as bad as Photoplay makes it out to be. There’s a couple neat set pieces and the action scenes are mildly amusing. Well, at least they are until the repetition sets in. Tarzan and the Golden Lion doesn’t have a lot to offer, and you’ll get tired of what it does have. The film’s biggest flaw lies with the man playing Tarzan, James Pierce. There is not a thing right about his look as Tarzan. Although he was only 27 at the time, Pierce is caked in so much makeup that you’d think they were trying to shield the age of an octogenarian. The only scenes where Pierce looks natural is when Tarzan is clad in a suit at dinner. He looks more like he swung on in from the wrong set, and he kind of did. Pierce was set to do Wings when Edgar Rice Burroughs (his father-in-law) convinced him to play Tarzan instead. If only he’d had a lion friend to save him from that decision.